We are manufacturing and supplying a broad range of Packaging Shrink Sleeve Labels, the most advanced and versatile form of labeling across the globe. We are offering a quality range of shrink sleeve labels, which are graced with vibrant hues and fine rotogravure printing. Our range of shrink sleeve labels is apt of all kind of packaging. These can enhance the appearance and increase the value of packed products. Their usage ensures and resist dampness, dust and counterfeiting. Our range of attractive shrink sleeve labels can be shrink on the most contour of varied container substrates including Glass, Plastic Bottles, Composite Cans, Tin Cans etc. 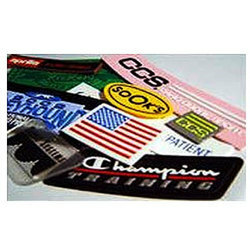 Looking for Shrink Sleeve Labels ?